The flag Puerto Rico was adopted on July in the year of 1952. The flag of Puerto Rico is comprised of five alternating white and red stripes, and a blue triangle on the hoist side, with a white star in the center of the triangle. The flag of Puerto Rico has five red and white horizontal stripes, with red on the top, bottom, and center, and white in between. On the hoist side, a blue triangle points inward, with a five-pointed star in white. 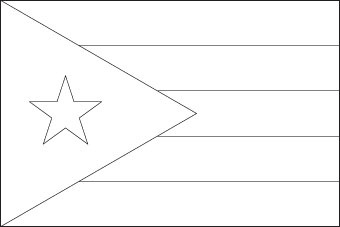 The star represents the the Commonwealth of Puerto Rico, and the triangle it sits inside shows the equality of each of the three branches of government, the executive, legislative, and judicial branches. The three red bands denote the bloodshed that allowed for the division of power of the government between the branches. The white stripes originally stood for victory and peace after independence, but were changed when the flag was officially adopted in 1952 to represent the new republican government. The blue used on the flag is not standardized, and can vary from light blue to dark blue. The flag design is an inversion of the colors on the Cuban flag. The Puerto Rican flag was first designed in 1892 by the members of the Puerto Rican Revolutionary Committee. After the United States annexed the territory of Puerto Rico, the national flag's use was banned from 1898 to 1952. The flag was adopted as the official flag of Puerto Rico in 1952.